The perfect combination of a 125's playful handling with impressive engine power very close to a 250. Equipped with an electric starter for the current model year, the 200 XC-W now receives a significantly stronger starter motor for improved starting reliability. Combined with its optimum rideability thanks to a new cylinder head and carb jetting, the 200 XC-W has become more userfriendly than ever. This makes it the first choice for all who are looking for perfect handling, first-rate comfort and plenty of power outside the competitive class society and who rate riding fun and reasonable costs above all else. The 250 and 300 XC-W models receive a stronger battery (4 Ah instead of 3 Ah) for more reliable starting. Shrouds, airbox cover, front fender, headlight fairing and the headlight have all been restyled for 2014. The KTM designer's focus was to achieve complete ergonomic harmony between rider and bike for a more stable ride and effortless movement on the bike. Adding to the improvements is a high-quality seat foam core to maximize comfort and durability. With the new front fender, the designers omitted ribbing on the inside to reduce mud and dirt buildup while increasing rigidity over the previous component by 50%. High-Tech Brembo brakes have always been standard equipment on KTM offroad bikes, and combined with the lightweight Wave discs, they are the ultimate solution in braking technology. In 2014 the XC-W models gain a new master cylinder with a new reservoir, a smaller piston diameter and a new lever with optimized kinematics. Combined with new sinter brake pads (Toyo B169), this makes for another perceptible improvement of front brake performance and action. New cylinder head with optimized combustion chamber offers more efficient combustion, better response especially under partial load, better power delivery and optimized rideability. The modern and lightweight frame design made of high-strength chromoly steel sections combines maximum longitudinal stiffness with optimum torsional ridigty. It guarantees easy handling and precise cornering, but also outstanding stability. 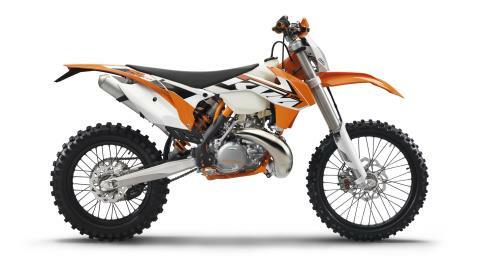 New, classy graphics with clear lines visually underscore the exacting standards of what KTM deems a true, cutting-edge offroad bike. All XC-W models are fitted with the super strong, tapered Neken handlebar made of high tensile strength aluminum alloy. The proven standard KTM mount allows to fix the handlebar in four different positions. 2014 sees the introduction of newly-developed hand guards made of 2-component polymer for more effective hand protection. The engine has a redesigned reed valve housing featuring Boyesen high-performance reeds. This has improved performance and responsiveness. The ignition curve and cylinder head have been optimized and the carburetor setting adjusted to make the 250 XC-W a great ride. The first rate WP Suspension elements have been further improved for 2014. Specially designed for enduro riding and in some models with an optimized tuning, they ensure maximum traction and plenty of comfort. Of course, compression and rebound damping can be adjusted to the track conditions and the rider's preferences with a twist of the wrist - the rear monoshock has separate high and low speed adjustments. Designed using the latest in calculation and simulation software, the design and wall thickness of the cast aluminum swingarm have been optimized for minimum weight at optimum stiffness and precisely defined flexibility. For 2014, the engineers have revised the chain guide to increase reliability while lowering the weight. The lower triple clamp has been redesigned for optimum accomodation of the new front fender. Thanks to its new contour and mounting with two front and two bottom bolts, the new fender has a lot more stability. High-quality, CNC-machined hubs are standard on all KTM wheels. The now black coated spokes increase corrosion resistance and center the new, extremely stable, 7050 aluminum rims from GIANT. Dunlop GEOMAX MX51 tires - provide excellent traction, very precise directional control and a long service life.